Lori and Julia are very excited about this next Pop-Up Marketing Shop! We’ve been posting a lot of Boomerangs on our social media lately and had such great engagement and feedback on them the girls decided to have their August Pop-Up Marketing Shop focus on these fun, short video clips. You’ve probably seen Boomerang videos on your friend’s or kid’s Facebook and Instagram pages. They’re quick little videos that are a great conversation starting and can be a lot of fun to include in your mix of content on social media. 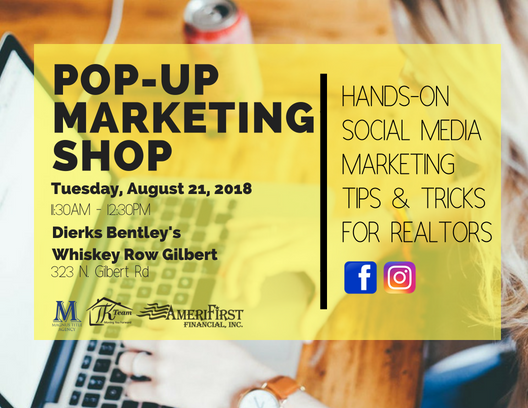 Tuesday, August 21, 2018 from 11:30am to 12:30pm Lori and Julia will be at Dierks Bentley’s Whiskey Row in Downtown Gilbert ready to help you shoot several Boomerang videos. They’ll have “Open House” signs and other fun props to incorporate in your videos that you can then schedule to post over the next few weeks, months, or to help promote an upcoming event! Want to see one of our Boomerang videos? Check us out on Instagram or visit our Facebook page. Let us know you’re coming so we can look for some familiar faces there! Shoot us an email, or send us an IM. We’re always plugged in! A special thank you to Magnus Title Agency for partnering with us on these awesome, monthly hands-on marketing workshops!